Website Images For Free Can Cost You Big Money! The Internet might seem like one giant, free photo bank but it is not. While there are some sites that offer free images for use not every image on the Internet is free. Many of the images on the Internet are copyrighted and must be licensed from the owner to use. When you hire a website designer to create your website you need to verify if the images they put out there are licensed to be on your website. It is your responsibility to verify that images your web designer used are not stolen! Just because an images is on google, yahoo, bling, twitter or anywhere else it doesn’t mean you can grab the image for free use! · To start, you should assume that all online images are protected by copyright. Then do your research to determine if the image you want to use actually requires permission. · When an image is registered with the US Copyright Office, the photographer can be awarded up to $150,000 per image for a willful infringement plus legal costs. Many photographers are pursuing these infringements. · A copyright image may or may not have a watermark on it. The law does not require a watermark to be a valid copyright infringement. Section 1202 of the US Copyright Act makes it illegal for someone to remove the watermark from a photo so that it can disguise the infringement when used. The fines start at $2500 and go to $25,000 in addition to attorneys’ fees and any damages for the infringement. · When you see a site that states Download Free Images here this should be a RED Flag these are most likely not a legit site and very likely will install malware on your site at the same time you download the stolen images. Most sites where they have free images without the photographers name should be avoided. All I can say is buyer beware! · Once you download an image and start using it, the image can easily be traced back to your business and you will be held responsible and have to pay. This includes all other social media sites like Facebook, twitter and many others. Posted in Articles on December 11, 2018 December 11, 2018 by Bee Creek Photo. We captured the McLane Stadium in Waco owned and operated by Baylor University and home to the Baylor Bears in this aerial panorama at sunset. Using our aerial camera we were able to capture this panorama with the Brazos river and the McLane stadium plus the cable stay bridge just as the sky picked up these wonderful colors of oranges and pinks and blue at sunset. You can see the light were on in the blue phase on the cable stay bridge on IH35 which help to enhance this image of the stadium. The cable stay bridge is slowly changing color after dusk and with this incredible colors of oranges, pinks and yellow at twilight we felt we had succeeded in a nice image of the stadium. The stadium was just complete in 2014 and has a seating capacity of 45,140 and is expandable to 55,000. 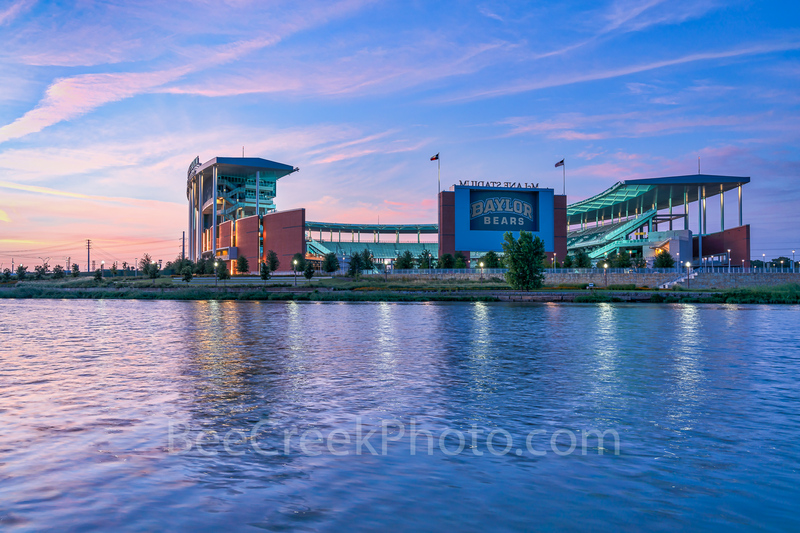 The stadium is located on the north bank of the Brazos river and fan can arrive at the stadium by boat and they can tailgait in the Baylor Basin next to the stadium. Not every universtiy can boast that feature. The unique horseshoe design of the stadium leave one side open to the brazos river and the university.. The name was changed to McLane Stadium in December 2013 to honor alumnus and business magnate Drayton McLane, Jr., who provided the lead gift for the stadium construction. The cost of the stadium was 266 million dollars to complete. The goal was to build a first class stadium for Baylor University and bring it back to campus but also to serve not only as the front door to Baylor University but also as the East anchor of downtown Waco and also contribute to the growth of Waco along with development along the Brazos Riverfront. Baylor McLane Stadium Sunset Pano – This is an aerial panorama capture of the Baylor University McLane Stadium in Waco with this view looking back over the waters of the Brazos river and the IH 35 stay bridge that runs along the side of the stadium just as the sun set and the sky lite up with colors of pink, reds, and orange glow. This stadium is part of the Baylor University campus and is home to the Baylor Bears team. A wonderful new stadium for Baylor and in this image we were able to capture this as an aerial panorama with this wonderful sunset looking back up the Brazos river towards the new stay bridge with their blue lights on. Sometime you just can’t capture an image from the ground and an aerial image allows us the ability to get a better vantage point where we were able to capture a better view of the stadium plus the blue led lighted stay bridge on IH35 or Jack Kultgen Freeway which goes over the Brazos river in Waco all in one shot with this wonderful sunset as a backdrop. This stay bridge is relativity new and has the ability to change to different colored led lights that slowly cycle to different colors phases around dusk which pops much better with this nice sunset glow you can see they were in their blue phase at this time which was a perfect backdrop for this image. Good sunset are hard to find and on this day we were bless with a great one but not enough time to send the drone up again. Next time maybe! We captured this image of the McLane Stadium at Baylor University right at twilight as the sky was lighting the clouds with these wonderful pink color over the stadium on the north bank of Brazos river. You can also see the soft green lights in the stadium that we thought made this image pop. This stadium offically open in August 2014 against the SMU where the Bears were able to defeat them 45-0. This is a good size stadium that has a capacity of 45,140 and can be expanded to 55,000 if needed. This stadium also sits on the north side of the Brazos River and their is a nice pedestrian bridge to cross over the Brazos river so people can cross from the university or can catch a ride on a boat. This is probably the only stadium that fans can arrive by boat and tailgate in the Baylor Basin next to the stadium. Sunset Over McLane Stadium – Another catch of the Waco Baylor Bears McLane stadium as the sunset left these wonderful pink clouds in the sky from across the Brazos river with the cool green glowing lights on inside the stadium on this evening right after sunset going into twilight. We are so glad we were able to capture this wonderful architecture of the McLane Stadium. This stadium architecture is unique and very attractive along the seating set up to look across the Brazos river to universtiy campus. We love the beauty of this new stadium I am sure the Baylor Bears are very proud of this new iconic landmark to their city. We wanted to show a capture after dark of the McLane stadium in Waco in a panorama. This stadium is owned and operated by Baylor University. It is a beautiful stadium day or night with the Brazos river on one side and IH35 on the other side. After dark you can see the McLane Stadium with all the lights on which gives an impressive site from across the water with nice reflections of the lights in the Brazos River and in this pano you can also see the lights on the pedestrian crossing bridge over the river from the campus of Baylor University. You will also note the soft green lights inside the seating which give a ghostly look to the stadium at night.This stadium was just completed and officaly opened in August 2014 for their first game with SMU which they defeated 45-0 a good beginning game. The stadium features the Baylor club, a dining and event spaced on the west side. In addition to sporting events Baylor and city of Waco plan to host concerts and other city events in the stadium. In addition the stadium has a large HD LED video board for viewing plays. The board is 5,029 square feet, ranking as the 13th largest college football video board in the nation at the time it opened. This new stadium is part of a plan to be the front door to Waco and enhance the growth along the Brazos and downtown Waco. McLane Stadium Twilight Pano – Another capture of the McLane Stadium with the building and pedestrian bridge in a pano with the lights on against a twilight blue hour sky with with clouds left over from sunset for a stunning look. The Brazos river capture some nice reflections from the lights of the McLane Stadium where the Baylor University Bears play their games. We capture this as a panorama so you can also see the the pedestrian bridge that crosses over the Brazos river in this panorama. Posted in Articles and tagged Baylor Bears, Baylor University, Brazos, campus, city, downtown, McLane Stadium, school, sunset, twilight, Waco on July 1, 2017 September 26, 2018 by Bee Creek Photo.